At the English Schools Athletic Association’s A.C.M. 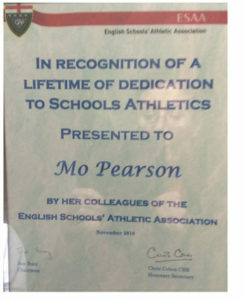 held in Birmingham in November, Mo Pearson received a long service award in recognition of the outstanding contribution that she has made towards the sport of athletics. Mo joined the P.E. Department at St.Ives Secondary School in 1973. The following year was the first of countless occasions during the past four decades that she has been a Team Manager for our County. She was elected Secretary of the C.S.A.A. in 1985 and has held the post ever since. Her contribution to the world of athletics in Cornwall, especially schools, has been enormous. Mo is someone with ‘old school’ values of organisation, discipline and respect. She has the ability to get the best out of her athletes, encouraging them to strive to reach their potential. Throws are her great love, especially the Shot where she has coached athletes up to and including International level. If a survey was taken of the people with the greatest number of attendances at National Schools Track and Field Championships for the past four decades, Mo would finish very high on the list. Mo has not only organised and officiated at Track & Field events over the years, she has given considerable support to Cross-Country. This has included being Chairman of the Billeting Sub-Committee for the National Schools Cross-Country held at Wadebridge in 1990. She was responsible for helping to find billets for what is reputed to be the greatest number of athletes in the history of the event. Since retiring from teaching, Mo has thrown herself even more into the sport. If she isn’t coaching or driving athletes to events as their Team Manager, she is attending coaching courses or committee meeting. Amazingly, she still finds time to compete herself! Mo is a member of Cornwall A.C. where she is Head Throws Coach (Level 4) and also looks after the Under 11 squad. She is currently the Chairman of the South-West Counties Athletic Association who fully supported the nomination. This award is thoroughly deserved and long overdue. Well done Mo!